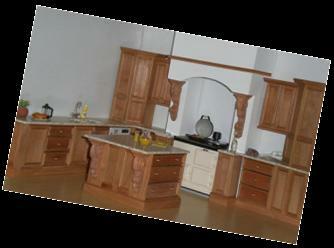 We produce a wide range of kitchens, some of them available as kits, others made-to-order. All of them are available with either fixed or fully opening doors and drawers, and the advantages of both systems are discussed here. 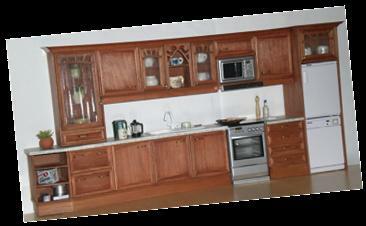 You may find it useful to think of our website as a virtual showroom. You can look around at all the options - there are several slideshows in different sections that show some of the kitchens we have made (or that our clients have made using our kits) and there are links in the text to various brochures and catalogues that give full details of a specific range (these are usually highlighted in green and will open in a separate window). You may like a particular kitchen, and wonder whether it will fit your room and just as in a real life with your full sized kitchen, you may fall in love with a kitchen in the showroom but you can't simply take it home, as you might with a table or a bookcase. You have to measure up, take into account the position of windows and doors, maybe add something that wasn't in the original, or change the type of oven, or the style of handles. 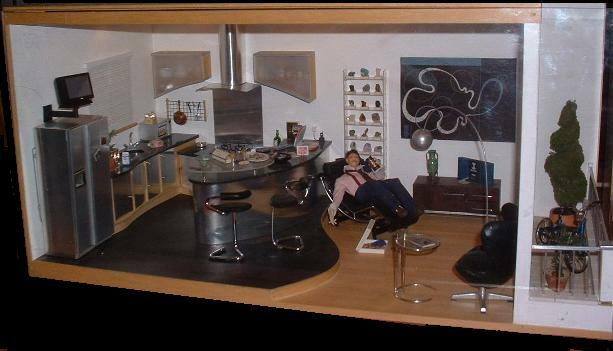 And it's just the same for your miniature kitchen. 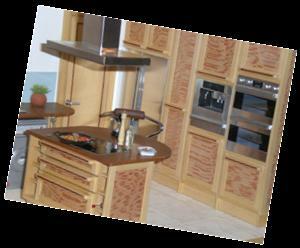 Whatever style of kitchen you choose (and it might be something that you haven't seen pictured on the website) we can help you create a plan to suit YOUR room, so that whilst the essential "look" of the kitchen remains, the layout will be designed to fit the space you have available. You might like to see here how one ELF client took her inspiration from a kitchen she had seen on our site to create, with a little help from us, something similar for her own house. With ELF the possiblities are endless. From the basic FLEXI and COMPACT kits to the full bespoke range, there are plenty of options from which to choose. 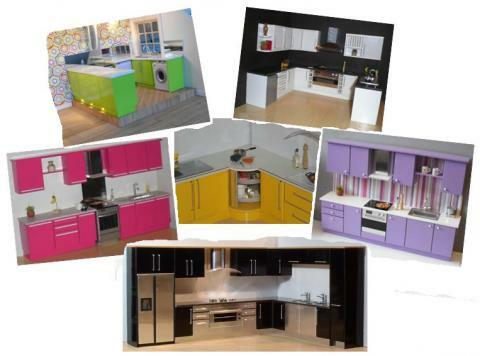 For instance there are now TWENTY different worktops available for the FLEXI and COMPACT ranges, and over forty for our fully bespoke range, including laminates, a range of exotic woods, and the latest "glass" tops in vibrant colours. 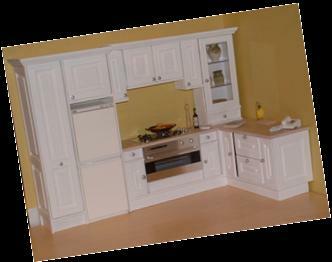 We can even arrange a custom-cut Decrastone top with moulded edges if you wish! We have pull-out full-length larder storage, basic base and wall cupboards in four standard widths (and other sizes when these are necessary to fit a specific space), lift-up units made to measure, extra wide storage drawers, wine racks in several formats, free-standing ovens, and built-in ones, double ovens, and microwaves, even a hi-tech built-in espresso machine! We offer a range of door styles from flat doors to moulded classic doors, all of which can be finished in a variety of ways and completed with one of the handles from a selection available. We also stock a range of appliances, including dishwashers, washing machines, under-counter fridges and large American style fridge freezers with drinks dispenser. For the bespoke ranges we offer a variety of natural wood finishes, including exotic hardwoods such as zebrano and ebony, while the hi-tech gloss finishes are available for all our ranges including the Flexi kit. If you prefer a painted finish, we can paint your units in the colour, or colours of your choice, matching if required your existing decor. 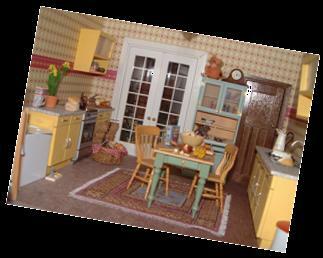 If you are making a replica of your own kitchen - or trying to re-create the kitchen from your childhood perhaps - we can help with one-off pieces that may be integral to the design. 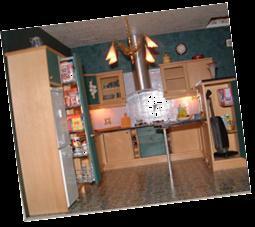 We can draw up plans based on photos or your sketches and description, and if you wish to use kits, we can suggest how best to approach the project, and if necessary we can supply modified units to suit your plan. On the left you can see how we created fretwork to replicate the original in the client's own kitchen, while on the right we have used drawerline units to replicate those of the client's 1950's kitchen, and added sloping wall units, very typical of that period. Whatever your idea of the perfect kitchen - cosy country or minimalist hi-tech, ELF has the answer. Please browse the different categories under KITCHENS in the main menu, and if you have any queries, please don't hesitate to contact us using the link at the top of the website.